1. Pre-heat oven to 500 degrees. Place one oven rack at the lowest position and one at the top position. Scrub the red potatoes and lay on a baking sheet. Add ¾ cup of water to the potatoes and cover with foil. Bake in hot oven for 30 minutes. 2. When potatoes are done, remove foil, drain, and let cool for 10 minutes. Toss potatoes with 3 tablespoons olive oil making sure each is coated with oil. Take a cup and “smash” each potato to about 1/3-1/2 in thickness (this is the fun part). 3. Drizzle another 3 tablespoons olive oil on the potatoes, sprinkle with thyme leaves and salt and pepper. 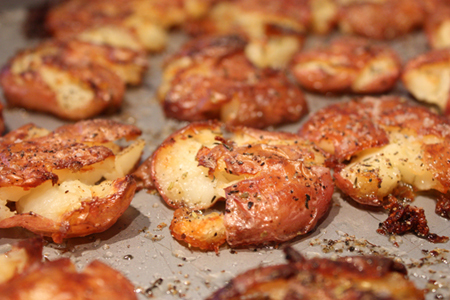 Place the potatoes in your 500 degree oven on the top rack and bake for 15 minutes. Move potatoes to the lower oven rack and continue to bake for another 25-30 minutes (until nice and brown). Hmmmm….crispy brown on the bottom, moist and tender in the center. These potatoes are so good! !